Earn 229 - 380 points upon purchasing this product. Use 2290 - 3800 points to purchase this product! Our Bovine Colostrum powder contains a minimum of 40% immunoglobulins (in proteins) and is collected within 6 hours of calving from Polish, grass-fed pesticide-free cows. The colostrum undergoes low-temperature processing along with testing to ensure that the different colostrum immunoglobulin fractions retain their biological activity and are not denatured. Even though our colostrum is skimmed to increase the relative IgG concentration, it has a rich and creamy texture. If these effects of colostrum sound profound, well they are. In fact if a calf does not get colostrum from its mother at birth, it will die of immune deficiency due to leaky gut and bacterial infection. So bovine colostrum performs this magic when fed to baby cows, but what about adult humans? Adult humans with their powerful digestive systems, in theory, should maintain their immune systems well, unfortunately, many of us develop leaky gut, SIBO , bacterial infections, autoimmune issues and so can benefit greatly from the help from our bovine ally who has gut healing off to a fine art and whose environment is more protected from chemicals toxins which humans are exposed to. IgA protects the intestinal epithelium from enteric pathogens and toxins, and is found in the mucosa in the gastrointestinal, respiratory and urogenital tracts, as well as in saliva and breast milk (Underdown & Schiff, 1986; Mantis et al., 2011). IgD can activate specific types of white blood cells to produce antimicrobial factors and is found in the blood serum (Chen et al., 2009). IgE is involved in allergies, as it binds to allergens and triggers release of histamine from specific white blood cells, but can also protect against enteric pathogens, such as parasitic worms. It is found in the blood serum (Pier et al., 2005). IgG comes in four forms, and is the most common immunoglobulin found in the circulation. It is the main component is the immunity against invading enteric pathogens (Pier et al., 2005). IgM is involved in eliminating enteric pathogens until sufficient amounts of IgG is present (Pier et al., 2005). Additionally, Bovine colostrum contains 4x more of these immune factors than human breast milk. For Typical Lab-Test Results, see below. Batch Tested as Free from Pesticides, Antibiotics, BPA, Yeast, Molds or Heavy Metals. greater than >40% Immunoglobulins within Total Proteins. Spray-Dried with Low Pressure and Temperature for retention of biological activity. Aside from its immune-transferring and tissue regenerating effects, colostrum is also an unparalleled nutritive. Colostrum contains every essential amino acid, every essential fatty acid and finally every essential glyconutrient (carbohydrate). If you did not know, there are many different essential sugars that, in trace amounts, optimise immune system function. This makes colostrum the one food that you would choose to bring with you to a deserted island. Colostrum, aka “pre-milk”, is produced by all mammals (including humans) during late pregnancy for their newborn to drink in the first few days of life, just before the breast milk comes in. The purpose of colostrum is to act as a form of passive immunity and provide a high dose of anti-bodies, such as IgA, IgG and IgM, which help to build the newborn’s immunity. It also contains antimicrobials and several growth factors. 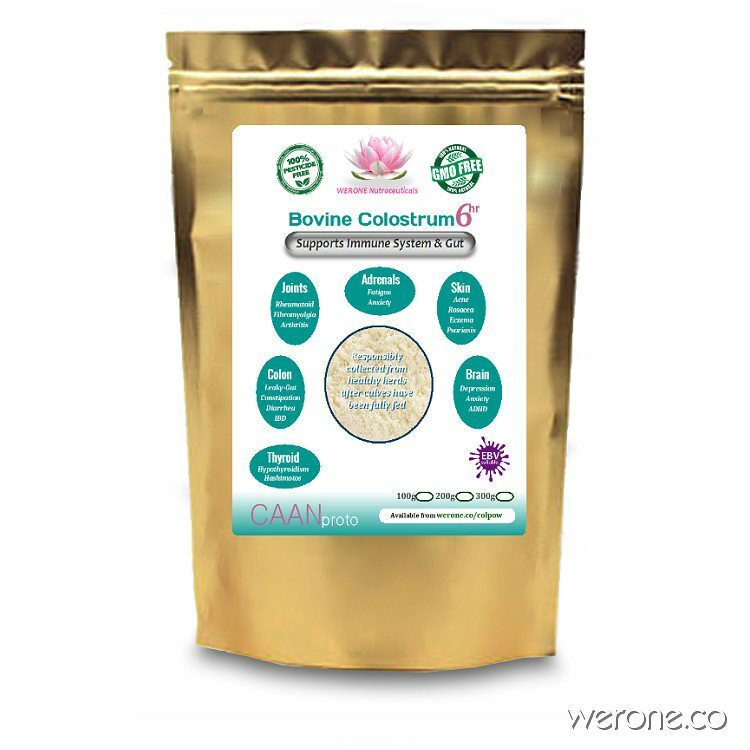 It is very important to take Colostrum on an empty stomach with lots of water to aid its transit into the upper intestine. Colostrum has no ‘known’ contraindications of any sort and with a 98.9% uptake into the body it is used to its fullest capacity within the body and body systems. Colostrum has a half-life of 6-8 hours, so for maximum benefit it is important to take it three times a day. Bovine colostrum may also be taken sublingually by holding some powder mixed with saliva behind the lower teeth. “Immunoglobulin from bovine colostrum effectively reduces and prevents viral and bacterial infections in immune deficient subjects: bone marrow recipients, premature babies, AIDS, etc”. New England Journal of Medicine.